Well, talk about a change of scenery! I’m here on Mindoro. I feel kind of like a foreigner here and I feel more and more inadequate at Tagalog. Elder Cox is my new companion. He’s from Wyoming and is really good at Tagalog. We got up, at the office elder’s apartment this morning at about 3:00 in the morning. Our flight left Manila at 5:45 and we flew on a two prop plane! It was really exciting. We got into San Jose about 7:00 and got picked up by the Zone Leaders in the van. We went shopping right off and also did email. Shopping here is just a bit different than back at Greenhills. We just shop at a really little place. They still sell everything that I ate back at “home” so I’ll still be okay that way. My area is the absolute farthest from San Jose and so we’re really out in the forest and in the rice fields. It was so good tonight we talked to people that speak all Tagalog! It’s really a beautiful language that I’ve come to appreciate. I hope I’ll get a lot better here at my speaking. I’m excited, of course, but I’m in truth feeling a little bit displaced. This is so different than Metro Manila. 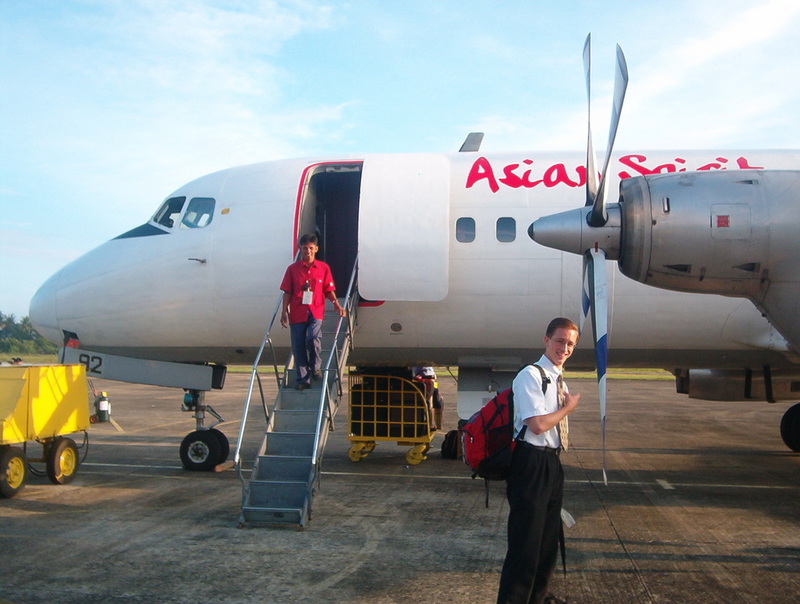 We flew on the Asian Spirit airline out from Manila to San Jose, Occidental Mindoro. It was quite the experience! This “It was really exciting” business hardly does this plane ride justice. I tell people about this ride all the time because it was so different and so unnerving. When we were sitting on the runway in Manila, the flight attendant was doing her usual spiel about safety etc. At one point she said “In the event of emergency power loss . . . “ and all of the missionaries looked at each other. There were four of use and we were on either side of the aisle in a single row, two to a side. As we were exchanging worried glances, the plane experienced an emergency power loss right then and there! The propellers just stoped working, the A/C cut out and we just puttered to a stop! Talk about scary! We were just sure the whole flight that we were going to have another one of those losses while we were in the air and that we would all crash! We made it safely but it was an experience to remember.